I love sunscreen. I would say I would worship sunscreen if it wasn't sacrilegious. A quality sunscreen is the best defense against sun spots and wrinkles. Since I rely heavily on potent treatments like glycolics, my skin has become more sensitive to sun exposure. I take sunscreen very seriously — more than ever — so that I can prevent damage instead of treating it! Unless I am filming or testing new products, I try not to wear foundation and instead, reapply my sunscreen throughout the day. There's a sunscreen for every skin type here, and all details regarding my updated Holy Grail line up can be found after the jump! 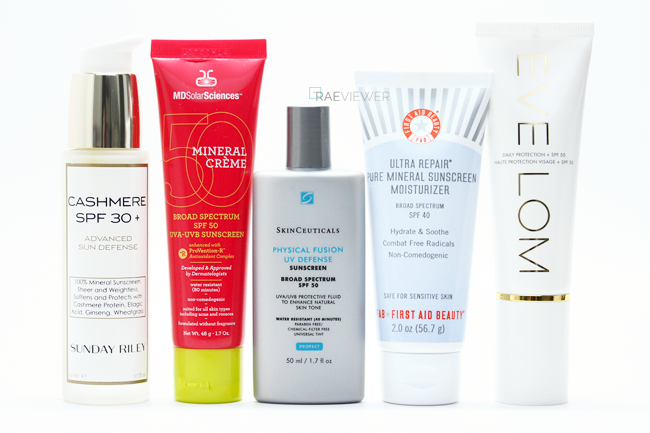 I did a Top 5 Sunscreen edit last year (click here), but the sunscreens featured here are a better mix of mineral sun protection, widely considered better for skin health. I recently made the switch because I've finally found some zinc oxide and titanium dioxide formulas that perform outstandingly well. Thank you, modern technology! This list is overall less luxurious, perhaps, but the best isn't always the most expensive. I always look for UVA + UVB protection because the goal is to prevent both photo aging as well as sunburns (my easy way to differentiate the two). Whether you choose a chemical or physical sunscreen, what really matters is that you WEAR SUNSCREEN DAILY! Sunny or overcast, slather it on. Even on days where I do not leave the house , I wear sunscreen. The sunscreen I have been wearing most frequently is the most affordable. 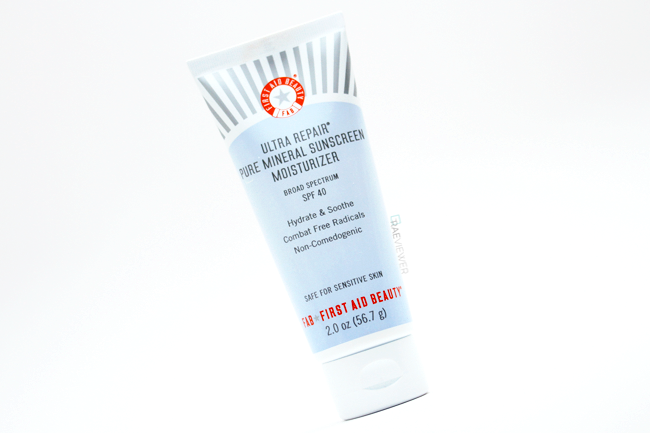 I love this newly launched First Aid Beauty Ultra Repair Sunscreen SPF 40 ($30) because of the non-comedogenic formula. I see far fewer blackheads than with most other sunscreens and no reactive pimples at all. A little goes a long way (edit: a nickel-sized amount as recommended by my dermatologist), and the white cast will fade away after a minute or two. It's a little thicker than I had expected, but the whipped texture feels creamy and soothing on the skin. This is a sunscreen moisturizer, so this multi-tasker cuts down on an additional step in my morning routine. Additionally, if you struggle with flakiness, the colloidal oatmeal in this formula will help relieve those pesky dry patches. The smell is also subtle, making this FAB Sunscreen is perfect match for those ultra sensitive skin. Since this one is small and portable, I throw it in my bag and reapply it every two or three hours on "no makeup" days. The other sunscreen to be reviewed here should be no surprise. I have raved non-stop about the fabulous Eve Lom Daily Protection SPF 50 ($90), and it is still my favorite despite the fact that it is a chemical sunscreen. It is an expensive daily investment product, but absolutely nothing works better — with or without makeup. Daily Protection will double up as your moisturizer and sunscreen if you have oily skin! I use 2 pumps when used as sunscreen and 3/4 pumps when used to double up. This sunscreen leaves no white cast whatsoever and absorbs immediately so I consistently reach for this on my bare-faced days. It truly brightens, nourishes, and firms the skin so it is worth every penny. I just ordered another (my first SPF repurchase) during the recent Sephora sale! 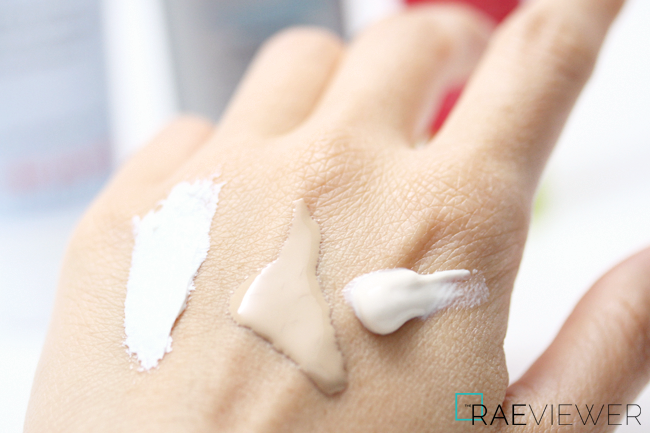 Since this is another dual-action protective formula, I skip moisturizer in the summer. During the colder, drier months, however, I use a separate moisturizer underneath. It has a dewy finish, which is excellent for dry skin and/or mature skin because it reduces the appearance of wrinkles. The packaging is as sanitary as possible, a pump with a lid. Next up is the coveted Sunday Riley Cashmere SPF 30 ($125). I wear this a couple times a week when I am home or out to run quick errands. Some with fair skin say it is completely sheer, but I do see a white cast on my light-medium skin tone. Unlike with First Aid Beauty's, the dry down is not invisible. If I don't take the time to blend Cashmere into my skin well (especially around the eyebrows), it is definitely noticeable. Other than the white cast, this lightweight Cashmere formula is awesome! It works for all skin types, although I think it suits combination to normal skin best. I just love that it feels like a lotion and comes with a pump that locks. 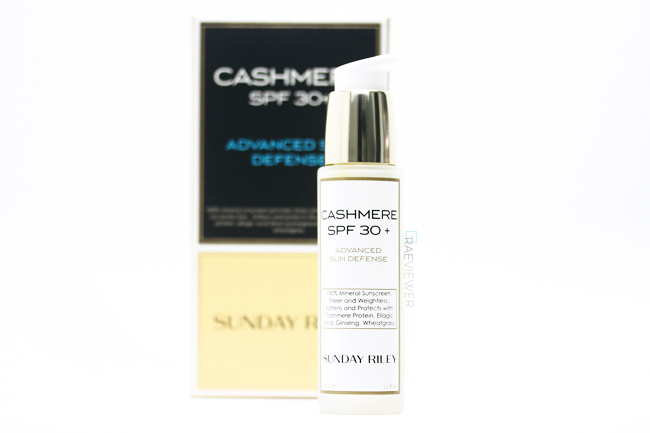 The cashmere proteins actually do soften my skin, and this sunscreen works very well when layered on top of Sunday Riley's Good Genes serum. Then we have the MD Solar Sciences Mineral Creme SPF 50 ($30), which is a phenomenal sunscreen and primer hybrid. This one is ideal for acne-prone, combination and oily skin. If you love primers like Benefit's Porefessional, you will fall head over heels for this sunscreen. It needs to be rubbed in thoroughly to maximize the benefits of the smoothing formula, but the performance is impressive. I am glad to have another affordable, non-comedogenic sunscreen in my arsenal. Due to the high zinc oxide content, foundation on top is a must, but I tend to reserve this for makeup days anyway. For humid weather or sweaty on-set situations, I will be relying on MD Solar Sciences because it has a long-lasting matte finish! It is available at Sephora, but I purchased mine online at Nordstrom. 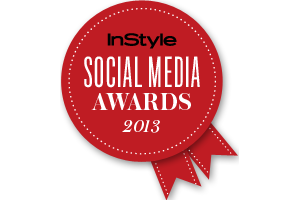 The award winning SkinCeuticals Physical Fusion UV Defense SPF 50 ($34) a subtly tinted sunscreen, also non-comedogenic. I still consider this a true sunscreen even with the color because the coverage is so minimal. Since it has a mineral formula, the barely-there tint essentially works to prevent the white veil that still plagues many physical sunscreens. The finish is luminous as advertised, but it does dry down more satiny, slightly powdery, after a couple hours on my normal skin. I highly recommend this as an everyday sunscreen, especially if you tend to skip liquid foundation. Those with oily skin will require powder to set. This Physical Fusion sunscreen is a thin, fluid formula so shake well and apply in sections. It looks a little grey on the skin for the first ten seconds, but once blended in, it becomes truly invisible. In general, I recommend wearing a dusting of powder or applying a foundation with a damp BeautyBlender sponge on top of mineral sunscreens if you feel self-conscious. The white cast is simply part of the ritual, so I have come to embrace it! When wearing makeup on top of these sunscreens, avoid application with your fingertips, which will rub away your sunscreen. Gently pat and blend in your foundations with a sponge, flat top brush, or big fluffy brush. And since this is consistently requested, here is my order of preference: (1) Eve Lom (2) First Aid Beauty (3) SkinCeuticals (4) Sunday Riley (5) MD Solar Sciences. 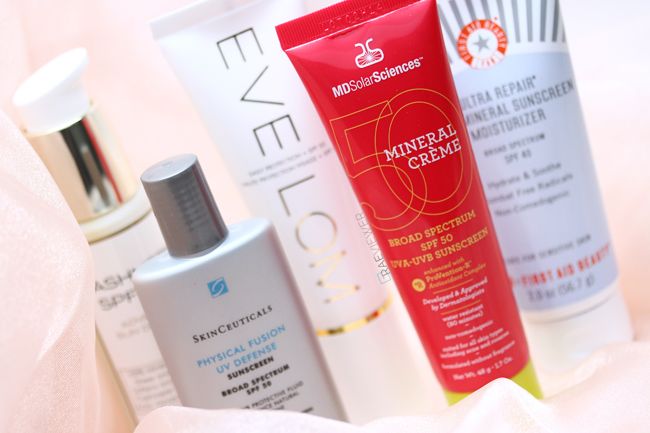 If you have oily skin, stick to MD Solar Sciences and First Aid Beauty. If you have dry skin, try Eve Lom and SkinCeuticals. Combination skin can use a variety of these five, but it will all come down to your preferences in finish! So excited to see my two favorite sunscreen brands here, MD Solar Sciences and SkinCeuticals. I use the tinted version of the MD Solar Sciences, and it is great! A little too drying for winter though, when I use the SkinCeuticals. I wholly disagree with your comment that a little goes a long way - the only way to get the stated SPF protection is to apply a certain amount, and being stingy will not get you the SPF 40 that is claimed on the tube. If you noticed, I only said that regarding the FAB SPF because it's such a thick, rich sunscreen formula. 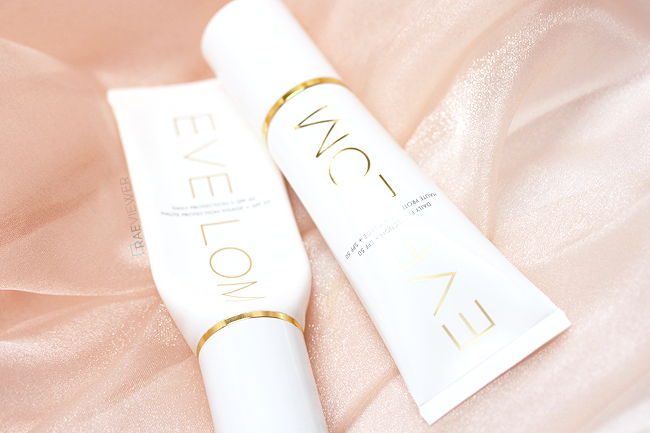 A pea size amount of the FAB is more than one full pump of Eve Lom's. I've consulted my dermatologist, who confirmed that a nickel-sized amount of sunscreen is sufficient. What's more important, rather, is that you reapply every two hours. I have never ever recommended stinginess with sunscreen. 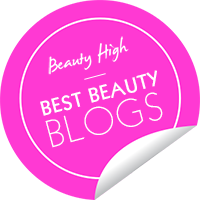 Excellent review of sunscreens! It's hard to find a good one for the face. Have you tried Coola Face SPF30? 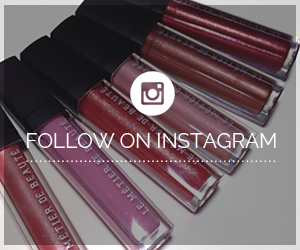 It comes in Cucumber Matte or Matte Tint finish. I love both because I can wear them with or without makeup. Because of the matte finish, I look more put together even if I don't put apply makeup. If I do apply makeup, it works nicely as a primer. Note: Eve Lom is not a mineral sunscreen. Important for those of us who are sensitive to chemical sunscreens. I never stated that it was. 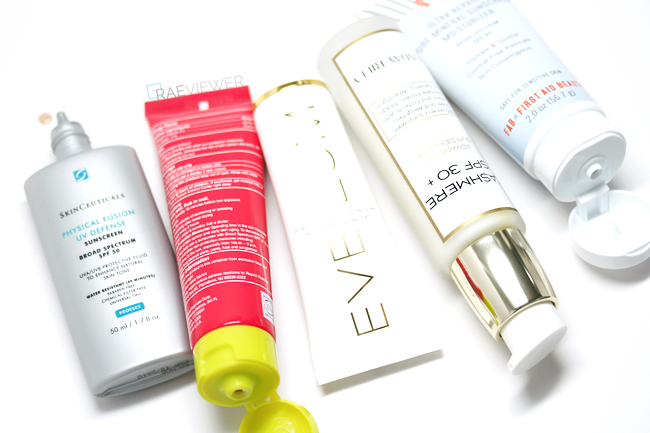 Like I mentioned, this is a Top 5 update and the Eve Lom was featured in my first sunscreen review. I will, however, edit the post to make it crystal clear! I recently started using glycolic treatments and was browsing for sunscreen solution. I have to admit I'm scared of using sunscreen on my face because my skin reacts pretty badly. It clogs my pores and causes breakouts. This post is very informative thanks for sharing. You should try Cotz Sunscreen in the Sensitive Skin formula. It's a little thick but is 20% zinc oxide. Best of all, it's only $20 at Ulta. I've used the MDSolarSciences and SkinCeuticals products above for quite some time and I love them both. I've been adding Cover FX Custom Cover Drops to both of these to increase the coverage and no longer need a separate foundation!